Thinking about incorporating mobile GIS technology into your fieldwork? This presentation will give an overview of the various ESRI applications we’ve used to aid hemlock woolly adelgid control efforts in West Michigan. You’ll see examples of each application and learn some of the advantages/disadvantages to each. Alicia has worked for the Michigan Department of Natural Resources, Parks and Recreation Division since May 2011. She provides GIS support (data management, mapping, & analysis) for the Division. Prior to joining the DNR, Alicia worked as a desert tortoise biologist in Nevada and California. 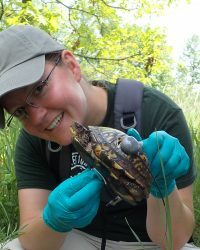 Alicia has a Bachelor of Science degree in zoology from Michigan State University and graduate work in Conservation Biology at Central Michigan University.